Mother Teresa died on 5 September 1997; she was beatified by St John Paul II on 19 October 2003 & canonized by Pope Francis on 4 September 2016. "Christ said, "I was hungry and you gave me food" (Mt 25, 35). He was hungry not only for bread but for the understanding love of being loved, of being known, of being someone to someone. He was naked not only of clothing but of human dignity and of respect, through the injustice that is done to the poor, who are looked down upon simply because they are poor. He was dispossessed not only of a house... but because of the dispossession of those who are locked up, of those who are unwanted and unloved, of those who walk through the world with no one to care for them. You may go out into the street and have nothing to say, but maybe there is a man standing there on the corner and you go to him. Maybe he resents you, but you are there, and that presence is there. You must radiate that presence that is within you, in the way you address that man with love and respect. Why? Because you believe that is Jesus. Jesus cannot receive you - for this, you must know how to go to Him. He comes disguised in the form of that person there. Jesus, in the least of His brethren (Mt 25, 40), is not only hungry for a piece of bread, but hungry for love, to be known, to be taken into account." Father Leo Maasburg has collected together 50 stories about Mother Teresa from over the 25 years he worked alongside her, particularly visiting with her countries that had been behind the 'iron curtain'. 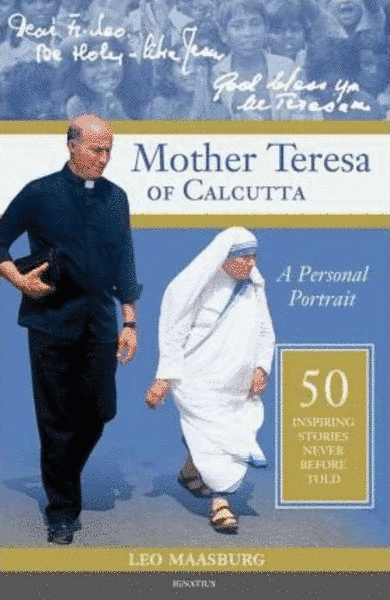 This book, 'Mother Teresa of Calcutta - A Personal Portrait' has been translated into more than 10 languages. Ruth, from the Totus2us team, heartily recommends it, having read it over a week-end (not being able to put it down), feeling like she'd met Mother Teresa by the end of it, and deeply moved by the stories that so beautifully highlight her faith. The book 'Come Be My Light' collates together the letters Mother Teresa wrote to her spiritual advisors over decades, almost all of which had never been made public before (Mother Teresa had asked for her letters to be destroyed!). They shed light on Mother Teresa's interior life in a way that reveals the depth and intensity of her holiness. For more about Mother Teresa, visit the Mother Teresa of Calcutta Centre's website. 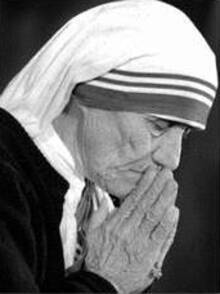 Blessed Mother Teresa: "Sanctity is not the luxury of the few. It is a simple duty, for you & for me. ... Very great holiness becomes very simple if we belong fully to Our Lady." "We all know that there is a God who loves us, who has made us. We can turn and ask Him, "My Father, help me now. I want to be holy, I want to be good, I want to love." Holiness is not a luxury for the few; it is not just for some people. It is meant for you and for me and for all of us. It is a simple duty, because if we learn to love, we learn to be holy. The first step to becoming holy is to will it. Jesus wants us to be holy as His Father is. Holiness consists of carrying out God's will with joy. The words 'I want to be holy' mean: 'I will divest myself of everything that is not of God; I will divest myself and empty my heart of material things. I will renounce my own will, my inclinations, my whims, my fickleness; and I will become a generous slave to God's will. With a will that is whole I will love God, I will opt for Him, I will run toward Him, I will reach Him, I will possess Him.' But it all depends on these words; 'I want' or 'I do not want.' I have to pour all of my energy into the words 'I want'. "What's all this about? Why I think it's so important is the theology of the resurrection. This is what Teresa teaches us about. As St Paul to the Philippians says: "All I want is to know Christ and the power of his resurrection and to share his sufferings by conforming myself to the pattern of his death." 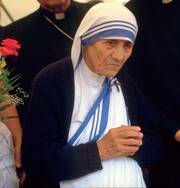 Teresa teaches us: 'If ever I become a saint, I will surely be one of darkness. I will continually be absent from heaven to light the light of those in darkness on earth." The paradox of darkness is that it is the gateway to light, through the cross to light - per crucem ad lucem. The key to holiness in every Catholic's life - not just in the lives of the great saints, every one of us is called to sanctity - must be this interiorisation of the Passion; of what St Paul of the Cross calls 'participation in the Passion.' Because if we can interiorise the Passion of Jesus Christ, live it in our own suffering, then we are open boundlessly to all that the Passion is for the redemption of the world. It is the means of our own purification, living our suffering, but even when we have done that, it is the means of reparation also, that we share Christ's redemptive role in the world, which is the dignity conferred upon us in our baptism. Mother Teresa says to the sisters going to daily Mass: 'Each sister is to do the work of the priest where the priest cannot go, and do what he cannot do. She must be imbibed by the spirit of Holy Mass, which is one of total surrender and offering. For this reason, Holy Mass must become the daily meeting place where God and his creature offer each other for each other and the world." What a staggering theology of the Mass - that you go to Mass offering yourself to God for the salvation of the world and, yes, God offers himself to you for the salvation of the world, and in that intimacy and communion we have joined the Cross and the Resurrection. Because, when St Paul tells the Galations: "I am crucified with Christ and yet I am alive. Yet it is no longer I who live but Christ who lives in me', it looks as if he is talking about the crucifixion, about darkness; but he's not talking about the crucifixion. He never knew Jesus of Nazareth on earth; he has only known the Risen One and what he is talking about there is the power of the resurrection, the power of 'per crucem ad lucem.' The last words to Mother Teresa: "The joy of loving Jesus comes from the joy of sharing his sufferings so do not allow yourselves to be troubled or distressed but believe in the joy of the resurrection. In all of our lives, as in the life of Jesus, the resurrection has to come, the joy of Easter has to dawn." So in the very darkness she lived, she was a witness to the resurrection and all of us are called and have that same gift offered to us in the daily suffering that we have in our lives." "One day Mother Teresa was asked by a bishop the secret of her success .. How she'd managed to touch the hearts of so many people. In reply she told a story - she said that when she was young she was walking with her mother to a neighbouring village, and it was somewhere she had never been to before. At one point in the journey her mother stopped and said to her 'Do you know where we're going?' and she replied 'No, this is the first time I'm going.' And her mother said 'You're right, you don't know where we're going but you're not frightened because I'm here and I'm holding your hand and I will lead you to the place we're going.' And her mother said her 'In the same way, as you're going through life, hold onto the hand of Mary and Mary will lead you to the heart of her son, Jesus.' And Mother Teresa said that was really the secret of her apostolate, that each day she thought about Mary and she felt herself holding Mary's hands and Mary leading her ever more deeply to the heart of Jesus. I found that such a powerful story, I think of it every time I pray the rosary, because when I pick up my rosary I see it as really holding Mary's hands .. and being taken into the heart of Jesus." "It wasn't until about 2 years ago I had a dream with Mother Teresa of Calcutta and she was in this beautiful , sparkling like altar and she was telling me to pray a lot to the Blessed Virgin Mary. I woke up the following day and told my wife "Wow. I had this amazing dream." I never had anything to do with Mother Teresa; how strange I had a dream about her telling me about the Blessed Virgin Mary and to pray a lot to her and to ask her for help ... This is my journey to the love that grew from my heart to Our Blessed Virgin Mary and I want to share it with everybody." Her mission to the urban and existential peripheries remains for us today an eloquent witness to God’s closeness to the poorest of the poor. Today, I pass on this emblematic figure of womanhood and of consecrated life to the whole world of volunteers: may she be your model of holiness! I think, perhaps, we may have some difficult in calling her “Saint Teresa”: her holiness is so near to us, so tender and so fruitful that we continual to spontaneously call her “Mother Teresa”. May this tireless worker of mercy help us increasingly to understand that our only criterion for action is gratuitous love, free from every ideology and all obligations, offered freely to everyone without distinction of language, culture, race or religion. Mother Teresa loved to say, “Perhaps I don’t speak their language, but I can smile”. Let us carry her smile in our hearts and give it to those whom we meet along our journey, especially those who suffer. In this way, we will open up opportunities of joy and hope for our many brothers and sisters who are discouraged and who stand in need of understanding and tenderness." "1. "Whoever would be first among you must be slave of all" (Mk 10: 44). Jesus' words to his disciples that have just rung out in this Square show us the way to evangelical "greatness". It is the way walked by Christ himself that took him to the Cross: a journey of love and service that overturns all human logic. To be the servant of all! Mother Teresa of Calcutta, Foundress of the Missionaries of Charity, whom today I have the joy of adding to the Roll of the Blesseds, allowed this logic to guide her. I am personally grateful to this courageous woman whom I have always felt beside me. Mother Teresa, an icon of the Good Samaritan, went everywhere to serve Christ in the poorest of the poor. Not even conflict and war could stand in her way. Every now and then she would come and tell me about her experiences in her service to the Gospel values. I remember, for example, her pro-life and anti-abortion interventions, even when she was awarded the Nobel Prize for peace (Oslo, 10 December 1979). She often used to say: "If you hear of some woman who does not want to keep her child and wants to have an abortion, try to persuade her to bring him to me. I will love that child, seeing in him the sign of God's love". 2. Is it not significant that her beatification is taking place on the very day on which the Church celebrates World Mission Sunday? With the witness of her life, Mother Teresa reminds everyone that the evangelizing mission of the Church passes through charity, nourished by prayer and listening to God's word. Emblematic of this missionary style is the image that shows the new Blessed clasping a child's hand in one hand while moving her Rosary beads with the other. 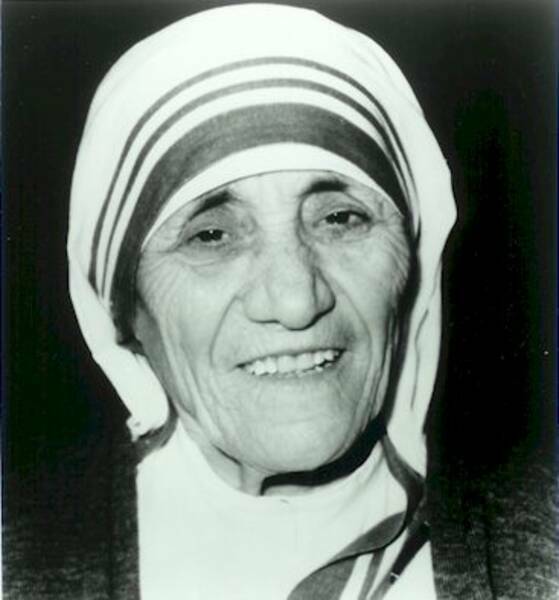 Contemplation and action, evangelization and human promotion: Mother Teresa proclaimed the Gospel living her life as a total gift to the poor but, at the same time, steeped in prayer. 3. Whoever wants to be great among you must be your servant" (Mk 10: 43). With particular emotion we remember today Mother Teresa, a great servant of the poor, of the Church and of the whole world. Her life is a testimony to the dignity and the privilege of humble service. She had chosen to be not just the least but to be the servant of the least. As a real mother to the poor, she bent down to those suffering various forms of poverty. Her greatness lies in her ability to give without counting the cost, to give "until it hurts". Her life was a radical living and a bold proclamation of the Gospel. The cry of Jesus on the Cross, "I thirst" (Jn 19: 28), expressing the depth of God's longing for man, penetrated Mother Teresa's soul and found fertile soil in her heart. Satiating Jesus' thirst for love and for souls in union with Mary, the Mother of Jesus, had become the sole aim of Mother Teresa's existence and the inner force that drew her out of herself and made her "run in haste" across the globe to labour for the salvation and the sanctification of the poorest of the poor. 4. "As you did to one of the least of these my brethren, you did it to me" (Mt 25: 40). This Gospel passage, so crucial in understanding Mother Teresa's service to the poor, was the basis of her faith-filled conviction that in touching the broken bodies of the poor she was touching the body of Christ. It was to Jesus himself, hidden under the distressing disguise of the poorest of the poor, that her service was directed. Mother Teresa highlights the deepest meaning of service - an act of love done to the hungry, thirsty, strangers, naked, sick, prisoners (cf Mt 25: 34-36) is done to Jesus himself. 5. "The Son of man also came... to give his life as a ransom for many" (Mk 10: 45). Mother Teresa shared in the Passion of the crucified Christ in a special way during long years of "inner darkness". For her that was a test, at times an agonizing one, which she accepted as a rare "gift and privilege". 6. "Lord, let your mercy be on us, as we place our trust in you". How often, like the Psalmist, did Mother Teresa call on her Lord in times of inner desolation: "In you, in you I hope, my God!" Virgin Mary, Queen of all the Saints, help us to be gentle and humble of heart like this fearless messenger of Love. Help us to serve every person we meet with joy and a smile. Help us to be missionaries of Christ, our peace and our hope. Amen!" Mary, Mother of Jesus, give me your heart, so beautiful, so pure, so immaculate, so full of love and humility that I may be able to receive Jesus in the Bread of Life, love Him as you loved Him and serve Him in the distressing disguise of the Poorest of the Poor. The poor are thirsty for water but also for peace, truth and justice. The poor are naked and need clothing, but also need human dignity and compassion for those who sin. The poor have no shelter and need shelters made of bricks, but also of a joyful heart, compassionate and full of love. They are sick and need medical attention, but also a helping hand and welcoming smile. The outcasts, those who are rejected, the unloved, prisoners, alcoholics, the dying, those who are alone and abandoned, the marginalized, the untouchables and lepers..., those in doubt and confusion, those who have not been touched by the light of Christ, those starving for the word and peace of God, sad and afflicted souls..., those who are a burden to society, who have lost all hope and faith in life, who have forgotten how to smile and no longer know what it means to receive a little human warmth, a gesture of love and friendship – all of them, they turn to us to receive a little bit of comfort. If we turn our backs on them, we turn our backs on Christ. To love her as He loved her. To be a cause of joy to her as He was. To keep close to her as He kept. To share with her everything, even the cross. It is possible that I may not be able to keep my attention fully on God while I work, but God doesn't demand that I do so. Yet I can fully desire and intend that my work be done with Jesus and for Jesus. This is beautiful and that is what God wants. He wants our will and our desire to be for Him, for our family, for our children, for our brethren, and for the poor. Each one of us is merely a small instrument. When you look at the inner workings of electrical things, often you see small and big wires, new and old, cheap and expensive lined up. Until the current passes through them there will be no light. That wire is you and me. The current is God. We have the power to let the current pass through us, use us, produce the light of the world. Or we can refuse to be used and allow darkness to spread.